The USB flash disks are a very efficient solution for data transportation or storage, as they can be attached to a key-chain, or reside inside your iPod, in a digital camera, in a handheld PC; they have a very low cost, and since not that long ago – large storage capacities. All these problems can be handled with ease if encryption software is used. 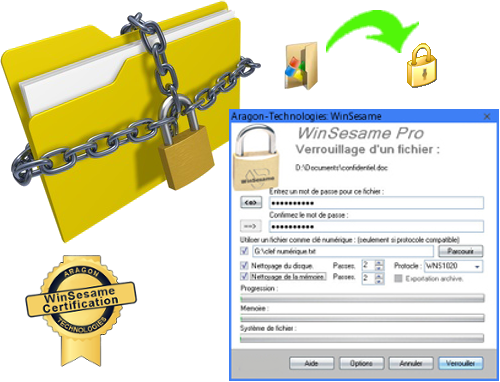 WinSesame offers data encryption, which can be used on any computer which runs under any version of Windows 7, Vista, XP, 2000 32 or 64 bits. WinSesame let's you encrypt and password protect all the files and folders in your usb flash drive, external hard drive, notebook, laptop, desktop and server. To lock a file or a folder click the Locking of a folder or Locking of a file icon in the main menu of the program. 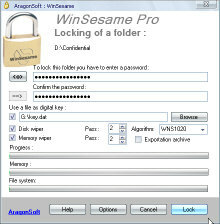 To lock a folder you can also right-click on the folder icon and select "WinSesame protection" in the context menu. The icon of the folder or file is modified to indicate that this document is locked. To open a protected document, double click it or click the Opening of a locked file or folder icon from the main menu and select the document. Enter the password. Once the document is decrypted, the program will automatically open the document. If it is a folder it is opened in Windows Explorer. If it is a file it will automatically open the application associated with this type of document.